The guy leading the charge at Cyanogen, which once proclaimed it was going to “put a bullet through the head” of Google and Android with its own open-source operating system, uses an iPhone. 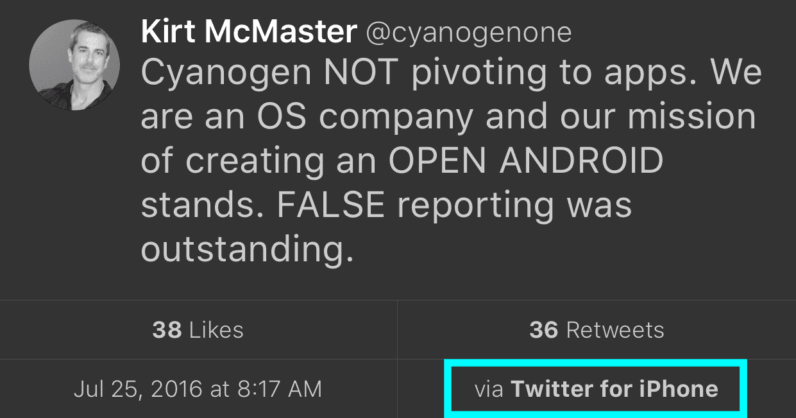 While tweeting that Cyanogen was not pivoting to apps, some noticed Kirt McMaster was using Twitter for iPhone. Even better: a quick jaunt through his Twitter timeline shows he typically tweets from the Twitter Web client or an iPhone. He doesn’t seem to use Cyanogen or Android in any way. And he doesn’t even use a third-party app like TweetBot, which shows you things like what Twitter client or app someone is using. McMaster has a good sense of humor about it though (from an iPad!). @maverick262 secret iOS CM. keep quiet. Running alpha. And hey, some might argue that the best way to ‘put a bullet’ through Android would be to switch to the iPhone, but that’s an entirely different argument from 2012 that we don’t need to dredge up. I’m just curious if McMaster uses a 6S or 6S Plus. Hit me up on Twitter and let me know, Kirt.